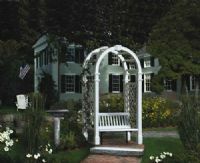 This optional 43” wide bench converts your arbor into a charming garden seat where you can retreat and relax. Two supporting steel brackets are included. Designed to fit with the Manchester Deluxe, Ashbury and Nantucket II arbors. For the Manchester, Fairfield II, Yorkshire and Newport Arbors, the opening must be reduced to 45". The arbor in this picture not included.